Giordano Philippines is inviting you to get a taste of what it’s like to participate in Monsters University’s Freshman Fair when it opens its wrought iron gates. 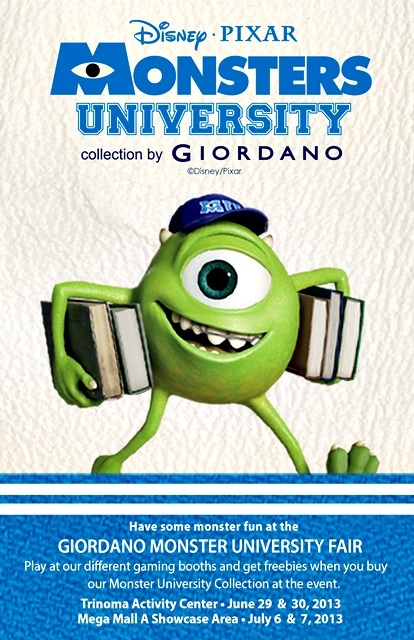 Experience being in the world’s best scare university, don Mike Wazikowski’s shoes and attend Giordano’s Monsters University Fair on June 29 to 30, 2013 at the TriNoma Activity Center and July 6 and 7, 2013 at Mega Mall A Showcase Area. Fun and freebies await you. No tuition fee required! Entrance is free for all! Yes, kids and kids-at-heart are all welcome! At the Giordano Monsters University Fair, several fun-filled games are in store for you. Test your mental speed with a playtime of 2Fuse at the first gaming station called Screamology. Combine numbers with similar colored cubes in 60 seconds. Do you think you are athletic enough to compete at The Field of Screams? This second gaming station allows sports buffs to size up their fitness and agility with XBOX Kinect Sports. Find out if you can make it into the varsity team or if you need more training. If you are into music, then the third gaming station called School of Rawr,is perfect for you. Amp up the volume and explore your musical prowess with the Guitar Hero. Compete for the highest score and earn the bragging rights as Monsters University’s primo rock star. You could even have your favorite monster character painted on your hand! Come and join us for some monster fun! Rawwwwr!